If there’s one thing I’d like to think GamingLives has achieved over the years, it’s helping to prove that adventure games aren’t dead, and doing so with the intensity of a man shouting those words through a megaphone while standing on twenty-metre-tall neon letters spelling out that exact sentiment. With a great resurgence in recent years, the genre is alive and kicking, and one of the people who we have to thank for that are Nordic Games, who’ve been picking up and publishing some of the finest titles around – including cult favourite The Book of Unwritten Tales, on Steam – and this E3 they unveiled their plans to keep you pointing, clicking and puzzle-solving through the long summer months. With his first adventure having been released six years ago (five outside of Germany), many may not be familiar with the tales of Jack Keane, but those who don’t will have a great chance to acquaint themselves with the burly explorer at the end of the month. Considered as more of a fast-paced point and click than the standard affair, The Fire Within contains multiple protagonists, a love triangle and puzzles that will force you to think and act on the fly, with the occasional run and jump moments to boot. With this in mind, we were shown a short scene where one of the female protagonists was forced to fend off attackers on a ship, distracting them by shooting and setting off a box of fireworks to allow herself a brief respite to move elsewhere and plan her counter-attack from a different angle. What piqued my interest was the emergent love triangle that surfaces throughout the story; Jack is accompanied on his journey by two women who take the other lead character slots, with one of them becoming the love interest by the time the credits roll. Handled in a manner akin to a moral choice system, there’ll often be several decisions of what to say or do where Keane will be forced to take the side of one leading lady, which will score him kudos with her at the risk of potentially alienating the other. 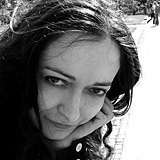 If handled intelligently, with it not just being an oblique black-and-white morality decision, it could make for an unprecedented approach to the genre, especially if the female leads are handled with respect. Differentiating between the multiple playable characters is also made easier thanks to the fact that each has their own unique ability or item that allows them to offer solutions in a way that the others cannot. Although I wasn’t made privy to what those would be, I was told that the gun was unique to the character we’d already seen, and that her sequences would have more of an action basis. Similarly tantalising is the idea that during the story there’ll also be several key sequences where Jack must go inside his own subconscious mind to get a better handle of his personal problems, and then solve puzzles in order to improve himself as a person. A fast-paced point and click with more than a few comedic glances towards the Indiana Jones franchise, Jack Keane 2: The Fire Within launches on the 28th June. From the creators of The Book of Unwritten Tales – a series that’s become beloved by many thanks to its amazing sense of humour that skewers the genre as much as it does anything else – comes an altogether more serious affair. Set in the early twentieth century, there was once a master thief known as The Raven, so called because he would leave behind a single feather at the scene of his crimes, choosing to be a sort of latter-day Robin Hood who robbed from the rich… and kept it all to himself. During his final heist, he was caught and shot dead at the scene, but some time later the trademark feather has shown up by the latest high-profile theft, and authorities are unsure if it’s the Raven of old or if a new upstart is playing copycat. Taking place over three episodic instalments, the first part concerns itself with a Swiss policeman who wants to become a detective, believing he can prove himself by catching the enigmatic Raven. The second and third acts of the story will be contained within their own chapters, allowing players to solve the mystery from multiple viewpoints, as each part will concern itself with a different protagonist. As with Jack Keane, The Raven has its own take on the point and click dynamic, and this comes in the form of realistic inventory handling. Instead of being able to carry nearly everything you see in an undisclosed location, you’ll only be able to pick up and store anything that you’d be able to in real life. The example given was that instead of being able to pick up a chair and store it for later use, you’d only be able to hold it in your hands and put it down as soon as you needed to do something else, so while you could transport it across the room, you couldn’t bring it with you for your whole journey. Similarly, if you were to pick up an axe, you’d have to hold it in both hands and put it down in lieu of other objects or to perform certain unrelated actions that didn’t require chopping things. 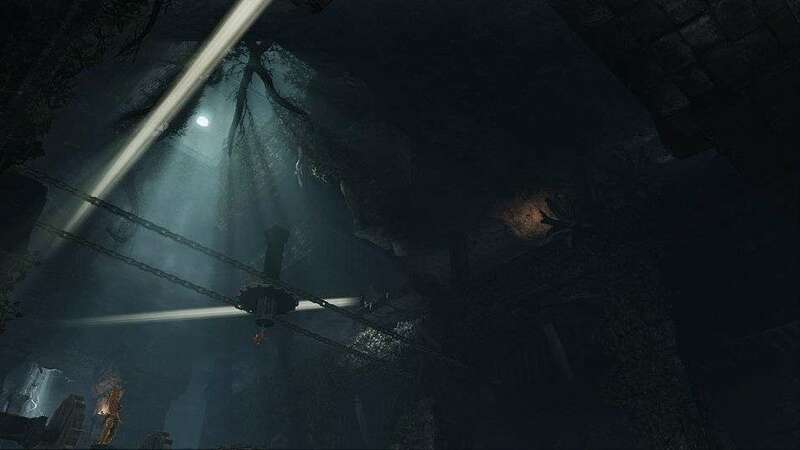 Those finding themselves stuck or unable to complete puzzles will find themselves in luck, as throughout the story you’ll be bestowed detective points that you can spend in order to give yourself hints as to how to progress. Those who’re more Sherlock than Watson will find themselves with leftover points to spend by adventure’s end, and these can be used to unlock extras, such as the industry-favourite concept art. Releasing on the 23rd July for PC, Mac, Linux, XBL and PSN, players will be able to purchase all episodes in bulk, though each will be available when they’re ready. Those who can’t wait for their point and click goodness can download the interactive novel that Nordic and King Art have released as a prelude to the events of the game itself, available via Android, iOS and through your browser at http://www.raven-game.com/ign-en/. 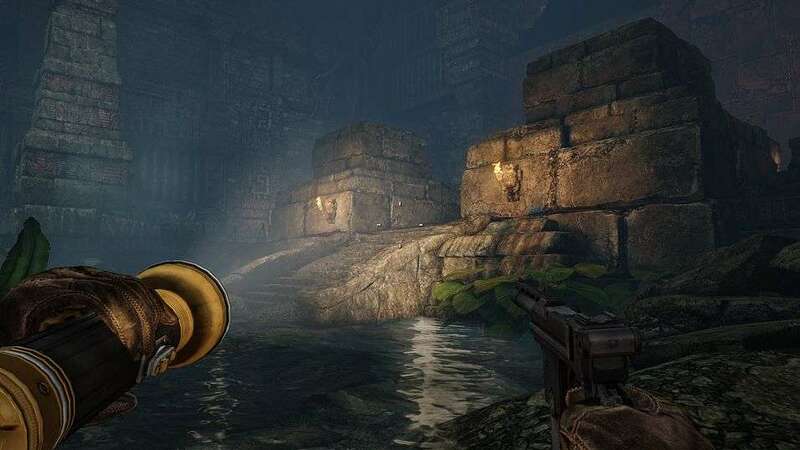 Sure, solving internal problems that improve you as a person, or having a realistic inventory system are great ideas, but have you ever tried to solve puzzles while fighting off hordes of mummified monsters? 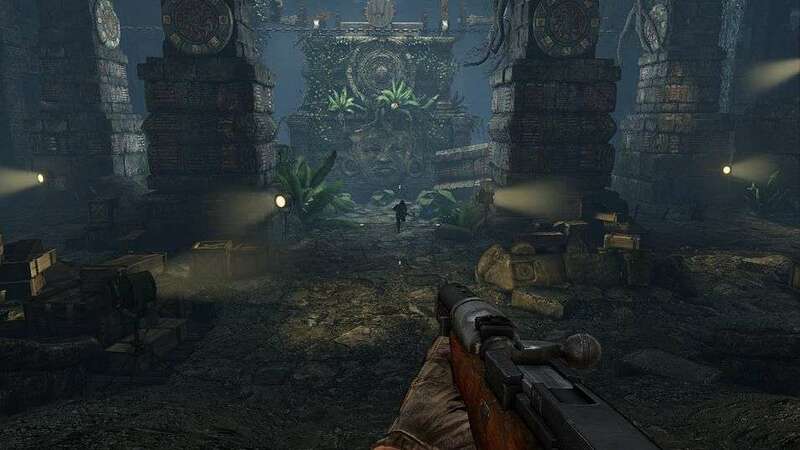 That’s the question Deadfall Adventures dares to ask, as it combines the puzzle-tastic adventure genre with a first-person shooter to provide something altogether different from the norm. 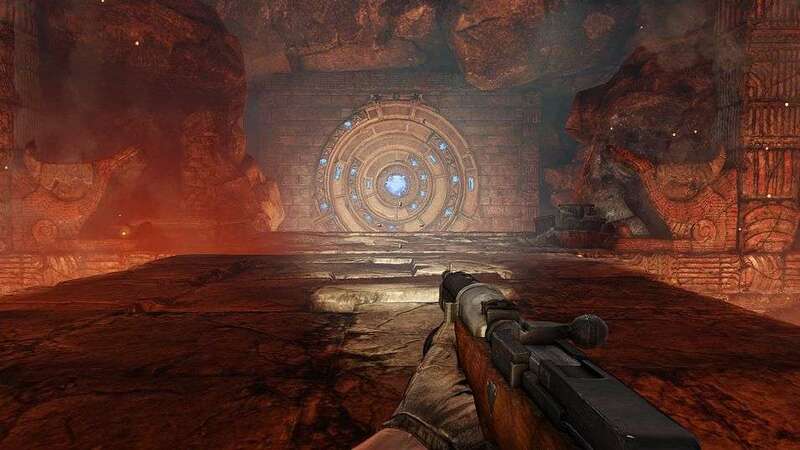 Taking place in the thirties, Deadfall sees an Indiana Jones-alike known as James Quatermain team up with former colleague and current US agent Jennifer Goodwin as they explore some Egyptian ruins in order to retrieve the Heart of Atlantis. Having to battle a horde of Nazis as well as the disturbed inhabitants of his globe-trotting adventures, James will have to battle foes and solve the myriad of puzzles ahead of him and Jennifer if he’s to prove he’s every bit the adventurer his great-grandfather Allan was. Before every mission you can choose how difficult both the puzzles and the ensuing gunfights will be, so you can accentuate your skill-set and customise the experience how you’d like it, with the conceit that you’ll probably spend more time shooting anyway, as there’s apparently a seventy-thirty split between action and puzzles. Luckily, you won’t have to worry about escorting Jennifer as you’re dispatching your foes, as she’s capable of looking after herself, and acts more as the brains between both herself and James, helping decipher the solutions to puzzles if you’ve spent too long without stumbling across the correct solution. Puzzle-solving doesn’t just help players progress through the story, but by collecting certain treasures dotted about in the environments James can be levelled-up and his action, health and skills improved. Divided into three colour sets, each treasure allows another part of that specific skill tree to be unlocked, bestowing a new ability or upgrade, but only if you care to make your way past the associated traps. 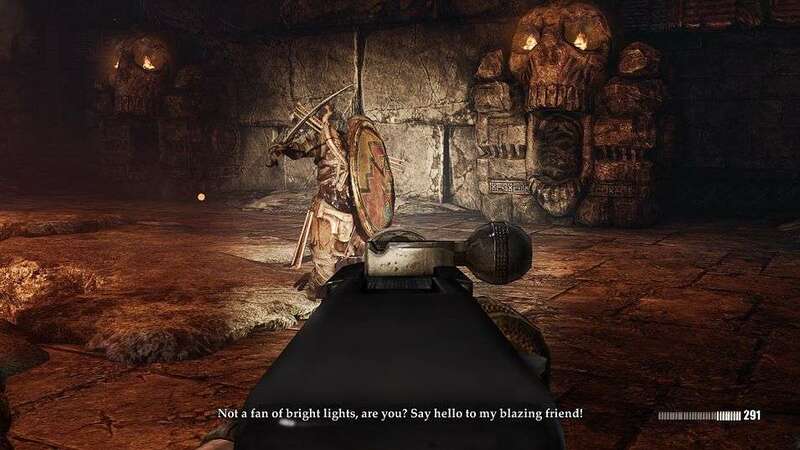 The fighting and shooting isn’t the only way to dispose of your foes as, much like the now-Nordic-published Alan Wake, certain foes are susceptible to the power of your focused torch, which can be attached to certain weapons to avoid a Doom 3 scenario where you’d have to choose between one or the other. 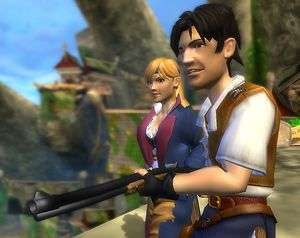 Although the final product lacks a co-operative campaign, there is multiplayer in the form of Treasure Hunt mode. Victory is dependant on points, which are rewarded for kills and setting traps, but moreso for uncovering the treasure on the map. There’s also an additional single-player and co-op horde survival mode where the player has to last as long as possible against waves of foes, but that intrigues less than the aforementioned multiplayer mode. Releasing at the end of September for PC and the Xbox 360 (and later on for the PS3), Deadfall Adventures will provide you with a take on the adventure game genre that you’ve never seen before, and time will tell if it pans out as well as I hope. Absolutely loving the sound of all of these. I’ve still not played the original Jack Keane game, but have been watching with interest as it has been gearing up for release across the channel, and wondering if the UK would be left out in the cold or not like we are with so many tantalising adventures from Europe. 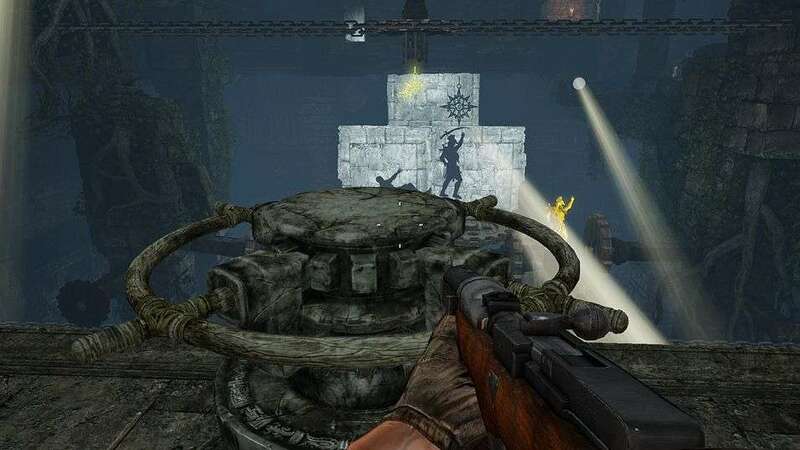 Deadfall Adventures looks gorgeous and I love the concept – a sort of Alan Wake meets Indiana Jones feel! Just my sort of game.